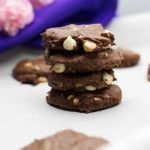 Chocolate chickpea cookies – with white chocolate chips and peanut butter, vegan and no refined sugar – what could be better? Chickpeas (garbanzo beans) in cookies? Well, since I’ve gotten onto Instagram and Pinterest, the number of posts that look at using chickpeas in a cookie or protein ball are amazing. I’ve had a recipe for chickpea peanut butter choc chip cookies on this website for ages (here) and they are always a winner. But, I wanted to try something different. So my brain started thinking – what if I turn these cookies inside out? 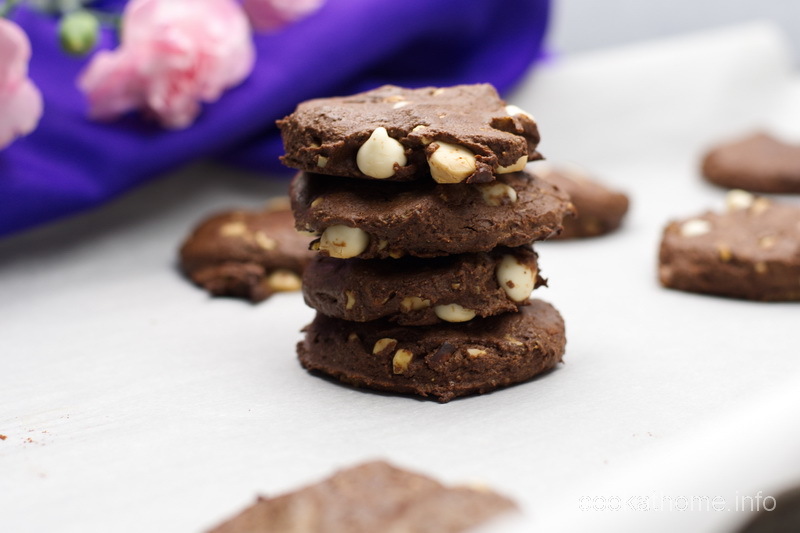 Have a chocolate cookie (with peanut butter of course) with white chocolate chips. And voila! This recipe was born. Now a funny story … when I was draining the chickpeas from the tin, I placed the sieve on the tin to get all the water out. I turned away to do something else, and the whole sieve toppled over somehow. A significant amount of chickpeas ended up in the sink, and the in-sinkerator (garbage disposal), so I couldn’t get those back. But I pushed on and made the cookies anyway. And they worked really well. But I would suggest you use the entire tin of chickpeas, not just the portion that I did! Feedback was that the taste was great, but they were quite dry. I’m thinking that with more chickpeas they would have just been perfect. Which you guys will have to try and let me know how they go! Drain the chickpeas and pat with a paper towel remove excess moisture. Combine all the ingredients, except for the chocolate chips, in a food processor and process until very smooth. Make sure to scrape the sides and the top to get the little chunks of chickpeas and process again until they're combined. Put in the chocolate chips and pulse it once or twice. The mixture will be very thick and sticky. Use a 1 tbs cookie scoop to make cookie dough balls and place onto a piece of parchment paper on a baking tray. Press down slightly on the balls as they don't do much rising.